Stay ahead of the competition & test your own voice chatbot concept now in only 1 day. Join forces with your technical and business or marketing counterpart(s) & let us know your motivation. Get selected for the event & work together on a voice bot for your business case under the guidance of our Chatbot experts. Present your voice chatbot to our jury, who will choose the best bot project. Take your voice chatbot & Google Home back to the office. Maybe even win a prize for it. This edition of the Chatbothon is full. Want to enroll for the next edition? 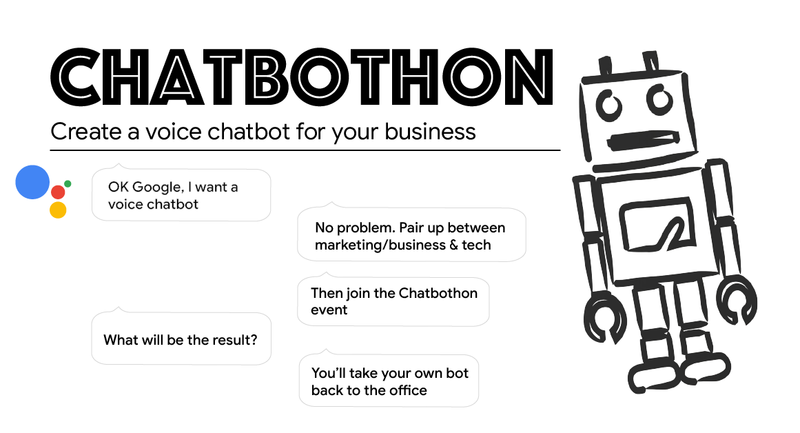 Submit the form below and we'll contact you when we organise the next Chatbothon! Your subscription will be reviewed by the Fourcast team. If approved, you'll receive a confirmation by email. Enroll now your company team of 2 to 3 persons, including at least one colleague with a Marketing or Business profile & one colleague with a Technical profile. Let us know your motivation: why do you want a voice bot & get a Google Home for your business? We will choose the teams that can participate based on this info, so try your best to convince us! Places for this exclusive event are limited. Get a team together & Enroll now! Places for this event are limited. We will select teams based on their motivation & composition of suitable profiles. This event is free for the selected teams. Every team will get a Google Home to take back to the office. Breakfast & Lunch will be provided. Share this event with interested colleagues or likeminded chatbot enthusiasts!